Location: Right behind you. BOO! So I caught an articuno and loved the thing dearly. Kings and queens of my collection! I *think* Mewtwo. ..but it might have been one of the legendary birds.. it's a loooooooooooong time ago. My brother told me that masterball could even catch other peoples pokemon.So i threw mine at a lvl 70 venasaur and the masterball flew away,empty, and was never seen again. I used on Moltres on my first poekmon game. Man I was so stupid! Then I did it on all my other Kanto games til I learned of the other legendary birds and Mewtwo. I felt like fesetting my games to use it on Mewtwo instead, like my friend did when MOltres flew away during battle, but I couldn't do anything to my Charlie and Squindle (charizard and blastoise). I trade/battle, PM me anytime! Maybe the Pokeballs are so good because there aren't that many types of balls, or you just got lucky...? 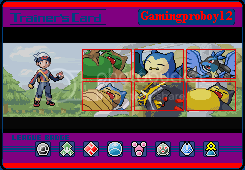 It's been a looong time since I played the original GB games, so I don't remember if I was that lucky, but I know they're not that good in FRLG, cus I tried a few times with ultra balls against Zapdos and Articuno on FR and they woulnd' be caught. Location: spying into your future. i can't even remember, it was so long ago. 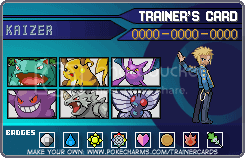 in yellow i don't know if i ever got to the legendaries, in blue i used it on either one of the birds or mewtwo. i can't find my blue and red to finish my game though. Well, for Christmas one year I got Yellow, my first game. I didn't wanna screw the coding up or anything (I was like 6 or 7 haha I didn't know) so I didn't use the multiplication cheat. Come to think of it I don't think I even used the masterball in Yellow, I caught all the birds with ultraballs and didn't even know mewtwo was in the game. A few months late I picked up Blue and eventually Red and used the multiplication code and caught literally everything in masterballs. Location: Nova Scotia. Yeah, It exists. 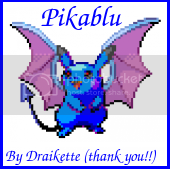 One time, my cousin carelessly used it on a golbat, and I was like, "NOOOO WHAT THE HELL ARE YOU THINKING!" He thought it was a normal old pokeball, just different color. This signature did not follow the rules and was deleted. Please shorten it or you may lose your signature privileges. I wasted mine on a snorlax. My first ever Master Ball was used on as I did not want to use it on anything but found out that Mewtwo has the highest catch rate back then & I just threw the Master Ball & said forget it, I got my Mewtwo & went on about my life. This was in Pokemon Blue. "The Nine Tails of Subconscious - Lawence Codye"
unfortunatley for my friend, he wasted his on a caterpie a few years ago i think. I used it on*cough*a lvl 4 rattata*cough* I didn't realize what I had thrown until I was facing Mewtwo a few minutes later, and didn't have my Masterball. This was in Blue Version. I used mine on a Gyrados I found in the Safari Owner's (The guy with gold teeth) backyard. I knew it could catch anything..but back then I wanted a Gyrados soooo badly and I couldn't catch the thing with ultra balls!! 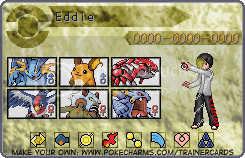 <- SoulSilver Friend Code on card. lol, back in the day when i had yellow version, i spent over five hours trying to catch an abra, but the dang thing kept teleporting away, and ultra balls werent working. despite knowing about the master ball and that it could catch anything, i got so fed up that i INTENTIONALLY threw the master ball at an abra XD. incidentally, i caught the mewtwo with a pokeball. go figure.